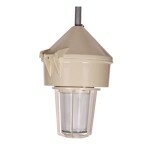 This is a very versatile LED fixture from Hazlux. They cover dual classifications for Class 1 Division 2 for liquids and gases – Class 2 Division 1 and 2 for Dust and fibers. 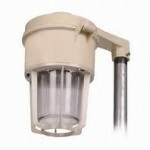 They are similar to the Metal Halide Versions in size and mounting options – pendant, wall, stanchion and cone top. They are multi volt 120/277 with. We offer below the most common wattages of 88w, 122w and 166 watt electricity consumption. This fixture is commonly used in: Oil and Gas applications, Paper Mills, Chemical Plants, Waste water treatment facilities, wood mills, grain silos, Fueling areas, etc. Prices below are for a 3/4 inch pendant mounting connection. Standard with globe guards. Reflectors optional. Also available in station and wall mount.